As marketers, we know there is not a faster, better, or cheaper route to commoditizing a brand than using unemotional language like: Faster … Better … Cheaper. Back in the day, Starbucks marketers were coached to: (1) NEVER communicate like a fast food company; (2) NEVER convey a new and improved mindset; and (3) NEVER allow a tactic to take priority over the company’s heritage and personality. Today is a different day. However, if Starbucks is to truly transform itself back to what in once was … it needs to also transform the language it uses. 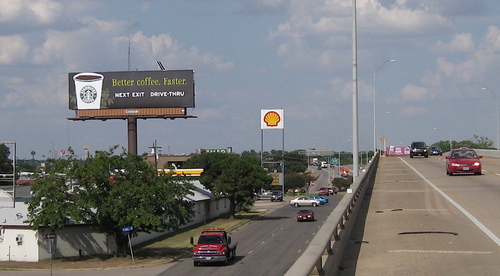 Since the billboard was in Texas, perhaps they should have added the phrase, "Bigger," too. Then they could have disobeyed the marketing rules that much more. Once they went with drive-thru and those horrible Interstate kiosks Starbucks stopped building relationships with their customers. I wrote about this topic in this entry the Departure of Interacting Relationships. Yeah, I don't get it. I was drinkin' the Starbucks kool-aid with the new CEO, until they started releasing all those smoothies and lemonade drinks. I thought they were getting back to coffee! I was expecting them to restore the customers' line of sight to the barista, maybe even stick some mirrors up above the coffee grinder so you could see it happening (I've seen this at Peet's). Sigh. You got more than enough to offer to your readers and Starbucks by talking about other stuff. They ain't listening. p.s. What a horrible message, very sad! Do we get some type of toy with our coffeee now as well? Scott ... these posts highlighting the good and bad about SBUX goings-on contain lessons for businesses. People can relate to SBUX and because they can relate to SBUX, I've found it helps them to better understand and apply these lessons to their business. That's why I will continue to highlight lessons to be learned from SBUX. The airport and mall outlets are probably the worst thing that ever happened to the SBUX brand: Should SBUX be in airports and malls? Absolutely! Should airport and mall stores be operated like fast food joints? Absolutely not! Yet here we are. Airport and mall SBUX are a solid idea, but if the execution isn't consistent with the "real" stores' core values and M.O., the experience suffers = the brand suffers = the perceived value of Starbucks drinks suffers. At least, in a street vs. airport/mall scenario, the brand maintains a semblance of authenticity and superior value in the (real) street stores. This kind of campaign, however, completely kills the value prop of the entire brand. The last thing SBUX needs to do is commoditize its brand and products more than it already has. I just overheard a discussion in the office this morning in which someone was talking about how they made the switch from SBUX to Dunkin' Donuts coffee months ago, and they have now switched to MacDonald's coffee. Specific prices were quoted, to the penny. As a closet SBUX regular, hearing someone talk about a shift (exodus) from SBUX to DD to McDNLDs coffee is pretty scary: In a market where McDonalds coffee is perceived as a better value than SBUX coffee - of comparable quality flavor-wise at half the price - I'm not sure that selling drive-through convenience and speed (fast food mentality) is the best strategy. Not to mention that better coffee (or tea, for that matter) cannot be brewed faster. You either have faster or better, but not both. Whomever came up with that bonehead sign/campaign has never learned the art of crafting a perfect expresso or latte in his or her life. I just don't understand the current version of Starbucks. That billboard message is not what I expect or want. First, billboards communicate cheap in my mind. Second, I'm buying value, not fast. If I want fast, I'll buy cheap. Aside from the bad strategy what a horrible execution (the copy is melba toast). That billboard is the fall of Rome. It speaks loud and clear that internally they no longer see or believe in their once powerful uniqueness. The moment that happens you become and behave like a follower. in regards to the smoothies, the really disappointing thing is that they didn't even get them right. if they're going to introduce a non-coffee drink that compromises their core equity, they should have done it in such a way as to make up for the loss of equity by gaining new equity. the smoothies could have earned them some cred with fitness enthusiasts, but instead they seem half-assed. they have only 16g of protein (25g would have been better), with 270 calories in total (nutrition information isn't available, but protein is 4 calories/g, which leaves 206 non-protein calories). finally, they should have partnered with a super-credible source for the protein like Beverly. instead, they used some no-name stuff that is probably perfectly good, but lacks credibility with enthusiasts. I meant it as a compliment to you and a failure of them. I for one am tired of all the bloggers talking about Starbucks (you're in a big group). It seems like everytime they do anything the blogs light up. It's not my cup of tea...badum bump. john, i totally agree. Alex wipperfurth would not be proud! So much of Starbucks’ efforts (and their remarkable success) in the 1990s stemmed from their ability to decommoditize the Starbucks coffee. It’s unfortunate to see all that great work unravel. It also appears whomever created this spot forgot the new (old retro) Starbucks visual identity features a brown logo on its cup design. So are we to assume the OLD Starbucks cup of coffee pictured here, is better and/or faster than the new? Or, that the NEW Starbucks cup of coffee (not pictured here) is better/faster than the OLD one featured in this outdoor spot. Ten iced lattes says this spot was NOT approved by anyone who understands brands, or what's at stake. However, one thing is for certain, the brand and it's stewardship is murky at best. BTW, I have tremendous respect, and hope for the Starbucks brand. Always have, always will. AbsoluteOne ... the retro SBUX logo is only being used for a limited-time. It's a promotional gimmick and not a permanent change. Myself, I'm not angry. I'm just confused. If SBUX were to make a permanent move to a retro logo, you can bet they would make lots of hoopla about it. This promotional retro logo coincided with the Pike Place Roast blend and the upgraded brewed coffee standards. You confused? Come on, you are a marketer with a keen understanding of brands and the juju associated with using retro iconography. I don't buy it you were confused. However, we can probably agree that how SBUX used the retro logo was more "noise" than anything else. True I understand and was once in charge of the marketing mumbo jumbo, but I was mentored to be a customer first and foremost. And as a customer I had/have a love affair with Starbucks. Consequently I'm hurt, I'm betrayed, I'm scared, I'm angry, but most of all I'm confused by all the changes. I witnessed the green cup dissappear right about the same time Wall Street made a big stink, and the CEO Brand evangelist returned. I saw all the full page ads in USA Today, and the Wall Street Journal. Things were gonna change. I'm excited but aprehensive. On my next tryst with SBUX, I saw the ceramic version of my beloved green cup "on sale." I know from being a long time SBUX lover that anything on the sale rack means whatever some marketing genius thought I was going to buy, "didn't work." So I asked a barista, "What's up with the sale cup." She said, "Oh, we're discontinuing that version." Huh? Extinct. Ebay fodder. Hoard it. So I bought 3 more for my co-workers who are also secretly in love with SBUX! You see, I love the brand so much I try to convince others to be in love with it too! Drink from the damn cup; its magical. At least it was for me. The only possible answer: Some manager who wants to make sure he makes his quarterly or annual bonus. Desperate people call for desperate measures. I look forward to the appearance of loveable characters, such as 'The Foam Burglar' and 'Mayor Macchiato.' And how about giving that slatternly siren a big red nose? Speaking strictly as a caffeine drinker who is not brand loyal to SBUX but does carry a gift card in my wallet, I like the sign. When I drive from Austin to San Antonio early in the morning five or six times a year, I stop at their store in San Marcos. I'd appreciate a sign like this reminding me of the correct exit. I'm as much into the customer experience as anyone, heck I write a blog about it, but I'm not an SBUX fan. Perhaps that's why I don't see this sign as the end of the world as some of the commenters do. Looks like someone didn't get the memo...or the new employee training...or the feedback from above regarding "brand management" and keeping on message. Replace Starbucks logo and insert Dunkin Donuts, 7-11, or any other convenience store...the ad is generic and weak...like watered down coffee. Unappealing and unmotivated...the visual equivalent of taking a sip and spitting out a bad taste. There's a lot of work to do at Starbucks and it will be interesting to see what happens and how it works out. John etal I completely disagree. This sign on the interstate is a welcome relief. It communicates exactly what I want, and need, on a long drive: quality, convenience, speed. And as it's from Starbucks, I know I can trust the message. I'm a huge believer in the consistency of branding, and building trust and community, staying true to your core values. And at 80mph on an interstate in a strange state, late at night, after 10-12 hours of driving... I couldn't give a rip less about 'em. I want 'better coffee, faster' [right now] and I want to know when I pull off the highway, I'm going to a brand that delivers this promise. That's Starbucks...for coffee on the road. 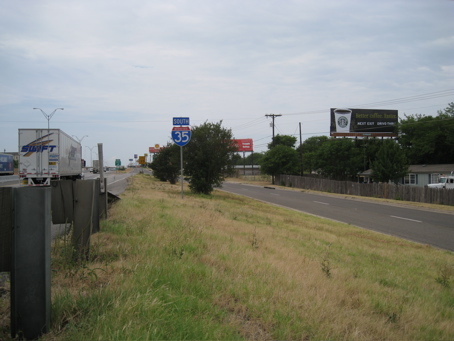 I'm on a roll...a billboard with your brand and 3 words is THE only way to communicate with your community who are also driving 80MPH, at the end of a long day, on a strange highway. Word-of-mouth in this context would be quirky...Rolling down your window and asking? C'mon on. I'm more of a fan of Starbucks because they reach out like this in a manner that helps me, when I need help. Community site are nice; not much help when you're driving. I come home and tell people where and when and how I found a Starbucks on I-75 in KY or in WV at the Truck Oasis out in the boonies or up around Lexington, Ky.
That's WOM as I define it. And...I remember to look for the sign the next time I'm driving through, even arrange my schedule for that stop. I am thankful for them violating all the rules about WOM and brand consistency by using a billboard to tell me they're there when I need 'em. There's a place for billboard ads. This is one. And it's well-done. "And I approved this message". Disclaimer: I have a family member who works part-time in a Starbucks. But not at any of these nor at any served by a sign on the interstate. And this loyalty/gratitude was there before he/she married into the family. Zane (aka ME) ... I ain't dissing the billboard tactic. I am dissing the "faster, better" copy for the reasons stated in the post. 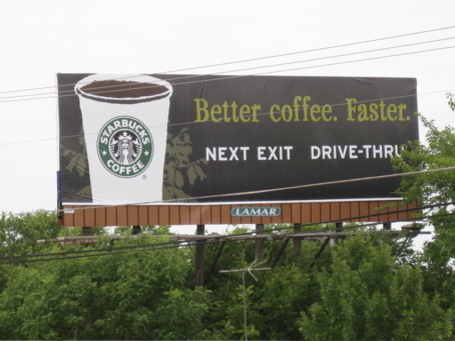 Had this billboard simply displayed the image of the SBUX cup with four words of copy: "Exit Now. Drive Thru." ... I wouldn't be calling it out as being detrimental. To feel the need to say BETTER COFFEE is what's wrong to me. Shouldn't the SBUX cup automatically convey Better Coffee? After all, the "Better Coffee" message should be the culmination of everything Starbucks has strived to communicate to customers since its inception. Back in the day we used to say, "The green dot says a lot." The dot (the logo) should automatically conjure up "better coffee" in the minds of consumers. To feel as though they need to say BETTER COFFEE tells me something is very wrong with the marketing efforts at SBUX. Great post on how Starbucks lost their mojo.